If you need a machine to surf online, watch videos and listen to your favorite music and what’s more do this with style and elegance this video review is for you. f you need a machine to surf online, watch videos and listen to your favorite music and what’s more do this with style and elegance today’s video review has something for you. 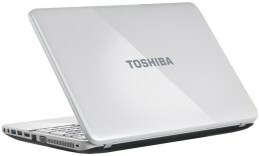 DigitalMagnet presents the entertainment machine Toshiba Satellite c855-1TT. At first sight the design stands out its curved lines and smooth edges. The white case with a brushed texture creates a unique appearance. The display is HD has a 15.6’’ diagonal with an LED technology at 1366×768 pixel resolution. The thing we didn’t like about it was the glossy display finish that reflects light in an annoying way, especially during outdoor exploitation. The visual performance is provided by an Intel HD Graphics 3000 graphic card. The key hardware features Intel Celeron processor at 1.8GHz working frequency and 2MB cache. The hard drive storage is 640GB SATA at 5400rpm. It is accompanied by up to 8 GB DDR3 RAM. The keyboard is island-style one with soft keys and a short stroke for an ultimate typing comfort. Unlike most laptop computers, this features a numpad on the right handside – it is extremely useful especially if you frequently work with numbers. The touchpad is placed a little bit to the left just below the keyboard in an elegantly curved frame. It’s perfectly responsive and features an embossed surface with two independently placed auxiliary keys. The sound system of Satellite c855 is above the keyboard and provides a decent quality. On the case frame centrally positioned above the display there is an HD webcam that provides a pleasant video-call experience with good visual quality. The laptop weighs around 2.3 kg which places the machine in the heavy category. According to Toshiba’s official information the 6-cell Li-Ion battery provides up to 5 and a half hours of unplugged work time. The case periphery features 2 USB 2.0 ports, 1 USB v3.0, an HDMI port and a card reader 5-in-1 that supports all the most commonly used card formats. The operating system that runs on Toshiba Satellite c855 is the new 64-bit Windows 8.